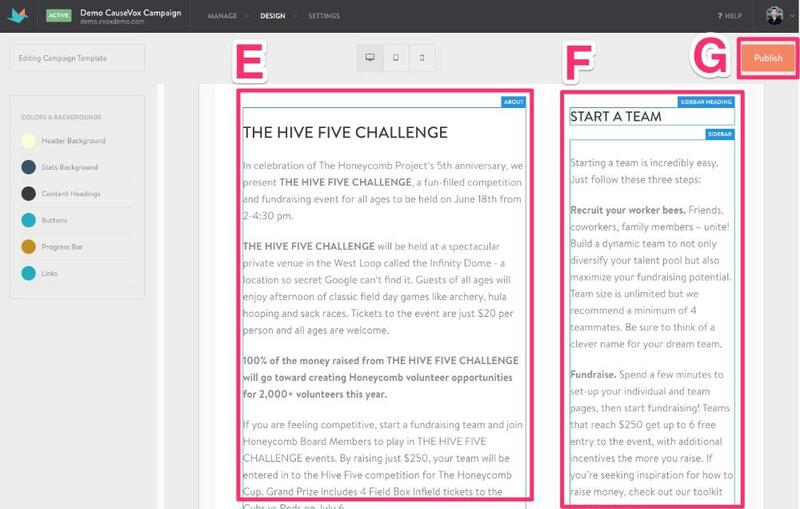 A: Once you launch the Site Editor, it automatically defaults you to the Campaign Home Page. B: Click on the CauseVox “Logo” located on the top of your page to edit it or delete. C: Click on each tab in the menu here to change the colors of the site to fit your branding. You can use a hex color code or just pick a color you like using our selector. D: Below the logo, click on the “Media” section to edit or delete. E: Below the media section, click on the “About” section to edit or delete. The About section comprises your fundraising appeal. Use the message editor to compose an effective fundraising appeal that provides your supporters with a clear and concise idea on the background of this campaign, its goals, and how it intends to fulfill its goals through these fundraising efforts. You can even embed video, or insert images in your appeal message to further enrich this content. F: To the right of your “About” section, click on the Sidebar Heading and Sidebar Description and put in your own content. G: When finished, click the Publish button on the upper right corner. Publish updates your site so that when you put it online, your design will be seen. If you have already launched your campaign site, it puts those changes online. Need some guidance on creating a visually appealing site that's in line with your branding? 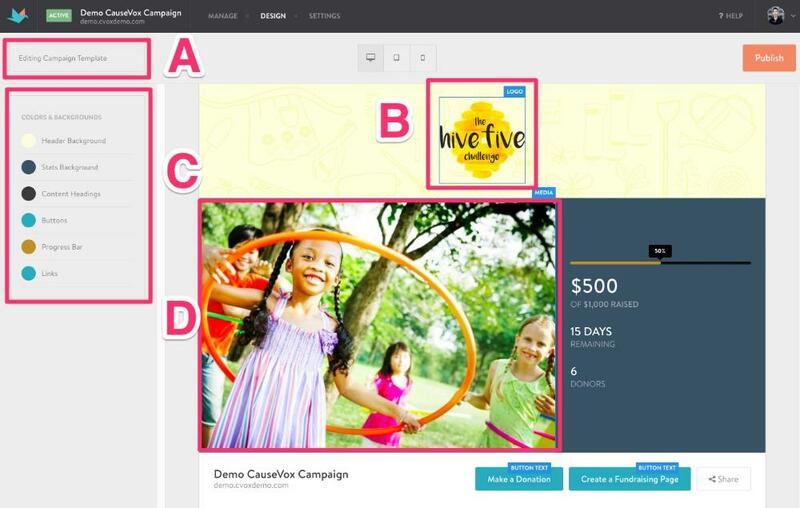 Here's our best practices for Designing A Campaign Site.